‘This is my real life’ week. To read how that began, you can click here for the opening post. eventually down to one, buy another book before you run out. Then repeat. relation to your home or workplace. celebrating the important moments in their life. you have a light?’ appeal between smokers. other element, be it the light or the stamp. In the case of the latter, you’ve also saved them time and possibly hassle. aren’t most experiences in this life? Grab opportunities to connect as much as you can. Buy stamps. this post encouraged you to buy some? 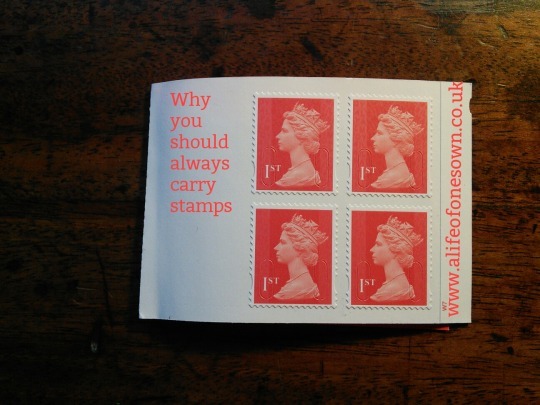 the A Life Of One’s Own Facebook page – or you can email (rae@alifeofonesown.co.uk).